Water is essential to not just our quality of life, but life itself. We cook with it, clean with it, live from it, and yet with modern infrastructure it is all too easy to take the availability of water for granted. In the event of a natural disaster – or even something as comparatively minor in scale as a broken water main on your street – the loss of safe drinking water can quickly become the most pressing concern. Emergency preparedness aside, those of us who live in the west and enjoy the myriad of outdoor recreation opportunities know that some of the most important logistics center on the water supply. Often, packing for a camping, hunting or other similar trip involves the need to fill and haul gallons of water, and at more than 8 pounds per gallon the weight alone makes this no light task. Big Horn Trading carries a variety of water filtration systems, ranging in size from systems that can provide a household with drinking water in the event of a natural disaster to a straw that allows hikers and backpackers to drink directly out of a stream. Whether it is a natural disaster or just setting up hunting camp for the whole family, having a high-capacity, gravity-fed filtration system will save you the time and energy of having to fill containers or use manually-pumped filtration systems. Just fill the reservoir and in no time your group will have clean drinking water – it is as simple as that. 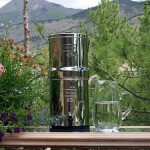 Berkey water filters are some of the best on the market, and lead the list of hydration items in our store. The Berkey water filter system is so effective it is considered a purifier, but does not use chemicals like typical water purification tablets. Berkey also shows that gravity-fed doesn’t mean slow, with flow rates that will have you drinking water in no time. Berkey’s water filter elements will last up to 3,000 gallons with regular, simple cleaning of the elements, meaning a standard two-element system will provide up to 6,000 gallons of drinking water. Whether for everyday home use or as an emergency preparedness item, a small number of filter elements will ensure your access to drinking water for an extended period of time.